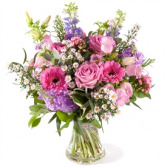 Blissful beauty is sure to show you care for any occasion. 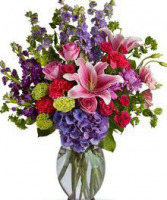 Beautiful garden flowers just like mom's garden make for a lovely gift of love. 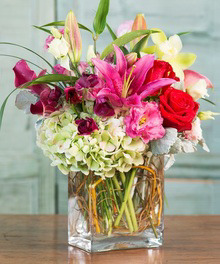 Beautiful garden blooms with bright yellow lilies, pink roses, snapdragons, wax flower and accented with pink and yellow carnations.